Dame Vera Lynn shot to fame as a singer during the years of the Second World War. Her performances, overseas and on the Home Front, kept up morale. She became a firm favourite among British troops and this popularity earned her the title ‘the Forces’ Sweetheart’. She was made a Dame of the British Empire in 1975. Vera Lynn was born Vera Margaret Welch on 20th March 1917 in East Ham in London. She began performing in public at the age of seven taking on regular singing spots at working men’s clubs. She was also a dancer for a time, performing with a troupe until the age of 15. After leaving school at 14, Vera left a short-lived factory job to focus full-time on her singing career and adopted her grandmother’s unmarried name, Lynn, as her stage name. Vera Lynn made her first radio broadcast in 1935, singing with the Joe Loss Orchestra. She released her first solo record, ‘Up the Wooden Hill to Bedfordshire’, the following year. In 1937 she began playing with the Bert Ambrose dance band where she met and married Harry Lewis, another Ambrose singer. Harry later became her manager. When war broke out in 1939, Vera joined ENSA (the Entertainments National Service Association) and toured Egypt, India and Burma. She took part in outdoor concerts for British troops, along with other well-known entertainers of the day, including Max Miller, Gracie Fields and Tommy Trinder. Years later, she received the Burma Star for her tireless work entertaining forces in Japanese-occupied Burma. It was during the war years that Vera recorded her most popular songs, including ‘We’ll Meet Again’, written by Ross Parker and Hughie Charles, and ‘The White Cliffs of Dover’ by Nat Burton and Walter Kent. From 1941, she also began to present her own radio show, ‘Sincerely Yours’. The programme featured songs and interviews with the wives of British servicemen. Vera also made appearances in three wartime films: ‘We’ll Meet Again’ (1942), ‘Rhythm Serenade’ (1943) and ‘One Exciting Night’ (1944). After the War, Vera returned to the variety circuit and continued her recording career. During the 1950s and 1960s she became a regular on both radio and television and achieved the accolade of becoming the first British artist to reach number one in the American charts with the song ‘Aufwiedersehen Sweetheart’. In the late 1960s and early 1970s she hosted her own BBC1 variety series and was a frequent guest on other variety shows, most notably the Morecambe and Wise Christmas Show in 1972. She made four Royal Variety Performance appearances between 1960 and 1990. In 2009 she became the oldest living artist to chart at number one in the British album chart. Dame Vera Lynn retired in 1995. Her final public performance took place outside Buckingham Palace as part of a ceremony to mark the fiftieth anniversary of VE (Victory in Europe) Day. As well as receiving her damehood, she was awarded an OBE in 1969. She continues to be actively involved in charity work, supporting charities which campaign on behalf of cerebral palsy and breast cancer research, Burmese refugees and animal welfare issues. On 97th birthday in 2014 she released a new album ‘Vera Lynn: National Treasure – The Ultimate Collection’, to coincide with the 70th anniversary of the D-Day landings. For her 100th birthday in March 2017, she will release another album to mark her centenary which will include some of her best known songs. Famous for his jump-suits and cape, and his trademark “ducktail” hair, Elvis Presley was known as “The King of Rock ‘n’ Roll” as he stormed across America with his amalgamation of African-American blues, Christian gospel and Southern country, which evolved into rock and roll. On the 16th August 1977, Elvis died of a heart attack. He had been suffering from health problems and addiction to prescription drugs. President Jimmy Carter said of Elvis: “Elvis Presley’s death deprives our country of a part of itself. He was unique and irreplaceable. Born on January 8 1935, Elvis Aron Presley had a stillborn twin brother, Jesse Garon Presley. As their only surviving child, Presley was said to have been inseparable from his mother, Gladys, and cherished by his father, Vernon.His relationship with his mother was so strong that even as a teenager he wouldn’t part from her side unless completely necessary, resulting in him being a very lonely and isolated boy. In his youth, Elvis entered numerous competitions – many of which he won – and appeared on television several times. His voice and performance were criticized, and it was suggested he had no true singing career. He was discovered by Sam Phillips and signed by Colonel Tom Parker who became his manager. His approach to music – through his voice, his lyrics and his “gyrating movements” – was different; so much so that he became both an icon for American youth and a symbol of parental anguish. Even when deemed a “danger to American culture” his fame could not be controlled. At the peak of his career, Elvis was conscripted into the United States Army. He served in Germany. Fans demanded his return. Despite this hiatus and the sometimes fickle nature of fans, sales and popularity did not drop and his return on March 2nd 1960 (honourably discharged March 5th) heralded his resumption as America’s – and the world’s – most famous rock and roll artist. His career path was not always even and Elvis staged at least one “comeback” notably using a television special to promote himself. He became a successful staple performer at the casinos in Las Vegas. Despite Elvis’s reputation as a “mama’s boy” and his inept approach to girls, Elvis had several relationships throughout his life, including Dixie Locke in his mid-teens and June Juanico, a former beauty queen. His most famous interests were undoubtedly Priscilla Presley, his only wife, and Ginger Alden, his last girlfriend. After five years of marriage to Priscilla, whom he had met whilst stationed in Germany during his conscription, they divorced and shared custody of their daughter. Ginger Alden met Elvis in 1976 at the age of 17 and eventually became his final girlfriend. This was publicly announced on TV during Elvis’s final televised appearance. His divorce from wife Priscilla, his performing career and public persona eventually crippled Elvis. He became overweight, isolated and addicted to prescription drugs, all of which affected his appearance, performance and health. He played his last live concert in Indianapolis and then all but withdrew from public view with Ginger Alden. On 16th August 1977, at his Graceland mansion, Ginger Alden discovered his body on the floor of their bedroom’s en-suite bathroom. At 3:30pm he was pronounced dead. He was 42 years old. Doctors declared the cause of death as a heart attack. Heart troubles ran in the family. His mother had died from heart problems and his father died two years after Elvis from heart failure. 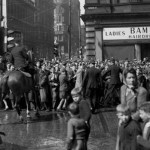 As the BBC announce they are to begin shooting a new film about the lives of Laurel and Hardy, we’ve trawled the Scran archives and found images of the comedy pair visiting Scotland on a number of occasions in the 1940s and 1950s. Laurel and Hardy remain one of the best known duos of American film comedy. Their slapstick style and faultless comic timing are still popular today, even though the first of their films was released way back in 1927. 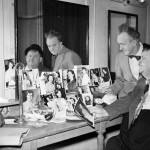 Stan Laurel was born Arthur Stanley Jefferson on 16th June 1890 in Ulverston in Cumbria. He was the son of a showman. By the tender age of 16, Stan was performing in music hall. He started as a supporting act but eventually became the star of the show and even understudied Charlie Chaplin. In 1912, he emigrated to America and changed his name to Stan Laurel. He found work but it took 12 years before he was recognised as an act of some merit. He performed eccentric mime and was known as a ‘nut comic’. Oliver Hardy was born in Harlem in 1892. He started in show business at an early age and by his late teens was a singer and ran a movie house with his mother. He aspired to take up comedy and started working with Lubin Motion Picture in Florida. By 1914 Oliver was acting and over the next two years made an astonishing 177 short films. He played a variety of parts – even women. Movie makers were keen to employ him and Oliver Hardy found himself in demand. Laurel and Hardy first appeared together in a film called ‘Lucky Dog’ in 1919. However, it was not until 1927 that they starred as the now so familiar Stan and Ollie in the movie ‘The Second Hundred Years’. Hal Roach decided the two should become a permanent duo and for the next ten years he worked with them, making silent short movies, talking pictures and feature films. Most silent movie acts found the transition from silent to talking pictures difficult but the contrast between Stan’s English and Oliver’s American accents and Oliver’s singing added new dimensions to their act. The well known catchphrase, often misquoted, is the most quoted line in the Laurel and Hardy movies. The basic premise of each of their movies was that Laurel and Hardy are two dimwitted men who try and accomplish something simple, but make so many mistakes that they spoil everything. Laurel was portrayed as the dimmer of the two. They used a great deal of slapstick humour and comical violence. The results of this violence were not always shown but sometimes illustrated by sound effects. Another common but smaller theme was what Stan Laurel called ‘White Magic’ where he would perform a bizarre and impossible feat such a getting dressed in seconds or using his thumb as a cigarette lighter. While their on screen personalities portrayed Hardy as the more organized man, it was the opposite in real life. Laurel wrote most of their material. Visually the two made a great comical pair. 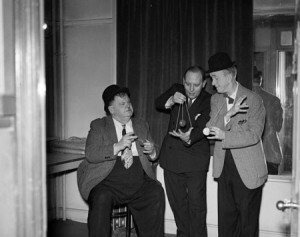 Stan Laurel was of average height and build but Oliver Hardy was a large and very tall man, making Laurel seem smaller. They dressed to emphasise this. Laurel wore a tight fitting suit and a bow tie, Hardy wore loose fitting clothes and a neck tie. Both wore bowler hats and had stylized haircuts. After many years working with Hal Roach the duo went on to work with 20th Century Fox and Metro-Goldwyn-Mayer. The films they made there were big box office hits but the duo had far less creative input than they were used to and critically the films were not as well received. 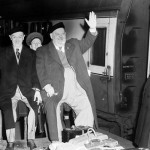 Laurel and Hardy decided to take to the stage instead and toured Europe. They made one final film together in 1950 called ‘Atoll K’ but both men were succumbing to ill health and it showed on camera. The film was not well received. After a short recuperation break the pair continued to work, doing small public appearances and making their only American TV appearance on ‘This Is Your Life’. Their final public appearance was for a documentary about the British Variety Organisation called the Grand Order of Water Rats. Their last appearance on camera was a silent home video shot at Laurel’s home which they called ‘One Moment Please’. Neither Laurel or Hardy ever recovered from their ill health. Hardy was instructed by his doctor to lose weight and rapidly shed over seven stone. The weight loss may have done more harm than good as he suffered a series of strokes. He lost mobility and speech and after a major stroke on August 7th 1957 he died, a shadow of the man he had been, weighing only 9.9 stone. Laurel was very ill himself, too ill, in fact, to come to Hardy’s funeral. This upset him but he knew his long-term comedy partner and friend would have understood. Laurel refused to perform again, despite requests, although he did continue to write. He wrote for other film-makers but also continued to write for Laurel and Hardy – material he wrote for his own pleasure. He also enjoyed correspondence and insisted on replying to every piece of fan mail personally. He was awarded an Academy Award for his contributions to film comedy in 1960. He died on 23rd February 1965 in Santa Monica. ‘The Sons of the Desert’ is the official Laurel and Hardy appreciation society. Set up by a fan and friend of the famous duo, John McCabe, the organisation took its name from one of Laurel and Hardy’s films. 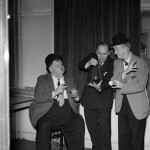 Stan Laurel himself contributed to the group’s constitution. The crest bears the words ‘Two minds without a single thought’ in Latin. Each branch has a ‘Tent’ name, again a film title. There are now almost 220 ‘Tents’.